I've recently become intrigued by the Chord EGG, and have in mind to design a new version not requiring any hard-to-get parts. I've already got the design pretty much fully formed in my head, and half of it down on paper (hint: it still uses only 5 chips like the original, but all 5 will be the same kind of readily available chip). More details when the design is done and the build under way. Of the four note selection oscillators, one is slightly different (besides the differences in component values to achieve different rates). 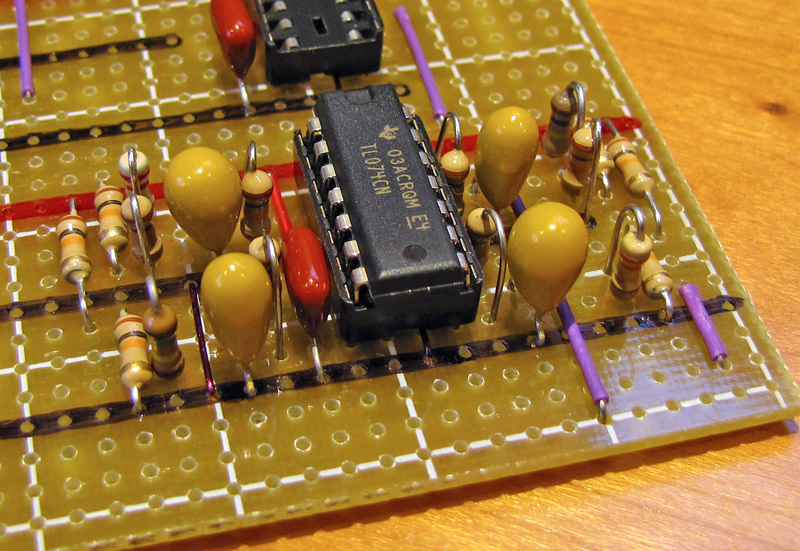 The one built around IC5C has two resistors in its feedback path, one blocked by a diode. My gut feeling is that this causes the oscillator to have a duty cycle of around 30% instead of 50%, but any idea why this was done? Last edited by stefanv on Thu Oct 29, 2015 9:49 am, edited 2 times in total. Yes, it looks like on the rise, the capacitor charges through the parallel 680K and on the fall, discharges through only one of the two, working to change the duty cycle from 50%. I can imagine this would add some "swing" to the timing and maybe even prevent synchronization or pronounced ticks/clicks from the same. Hi Stefan and PAiA Phans! If anyone is interested in what a PAiA Chord E.G.G. (Encephlo Gratification Generator) sounds like, listen to the Synergy album: "Computer Experiments". Mr. Fast uses a Prophet 5 for the vcos and vcfs and a PAiA 8700 computer running John Simonton's "Pink Tunes" program to generate the notes and chords using a custom interface. lots! of unused headroom. So, INSTEAD of modifying the cloned pcb, I built a dual preamp daughterboard to amplify both channels of the E.G.G.output just before the filters. Man, What a difference!! Even rigged up a PAiA headphone amp so I could listen without a stereo amp. The 6 parts of the LM3900 used for the random trigger generators are long period astable multivibrators. Basicly, they are comparators that charge up to a certain voltage then trigger, creating a slow repeating square wave output. 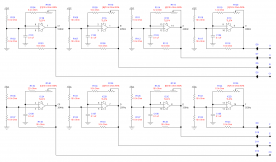 The LM3900 application note, AN72, shows this circuit with and without the diode. The diode is there to change the charge/discharge time to make its output to be less than the 50/50 of a square wave and more of a pulse. The Old Crow did a TOG with a PIC16C74, I believe. 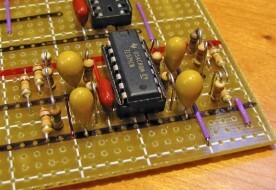 I made a PIC16F84 work on a breadboard. All of the OR gate functions used for combining the astables, and the astables themselves, could probably be implemented into a PIC or other cheap microcontroller. I'd still stick with the LM3900s for the analog portion because they are unipolar. Just wanted to update everyone (anyone?) on the progress. 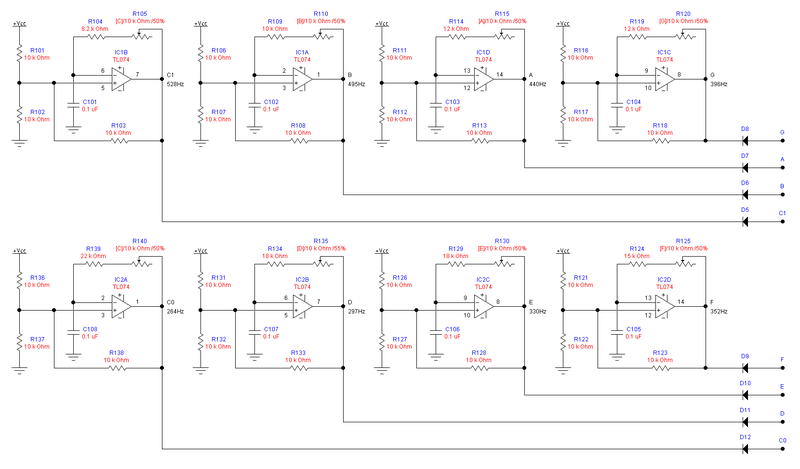 I've got the basic design completed (schematics only at this point, no layouts), but I'm slightly stuck on the filters. I'm not all that familiar with current-feedback op-amps like the 3900, but it was easy to redesign all the time interval generators using regular op-amps. However, I'm not sure how to proceed with the filter section using regular op-amps, and would appreciate some advice. I want the filters to remain as close as possible to the sound of the original design. If anyone's interested, I can post the schematics as they are so far. The filtering of Chord EGG is according to the resistor and capacitor values in the output amp feedback. Note also the trim to adjust the bias voltage to the diode. Its impedance and the filter frequency change with the bias and filter drive voltages. The 9302 Drum Tone Board uses a similar, but fixed, filter arrangement for the snare's noise section. That means, on average, the C-E-G chord is selected 35% of the time, the F-A-C chord 28%, D-G-B 20%, and E-G-C' 17%. I would have expected 50% duty cycle oscillators, resulting in each chord being selected 25% of the time. IC5C is the one with the strange feedback network described in an earlier post. I surmised this was to make the oscillator more asymmetrical, but in fact it has the opposite effect. R20, which converts the voltage across C9 into a current, has a significant effect on the timing, causing C9 to discharge through R19 and R20 much faster than it charges through R19. At 12V, I found that this wouldn't oscillate at all. R100 and D15 (which based on their component numbers, were added as an last minute change) serve to correct this imbalance. EDITED to correct some errors. I'd typed in the wrong set of results. Time for another update. I've finished a circuit board layout (I'll be using stripboard), and have started making the board. It's 2.7 x 7.7 inches. How does that compare to the original? My eventual plan after playing with it for a while is to make it into an alarm clock, using the Chord Egg sounds as an alternative to a radio. I'll post the schematic, board layout, and some brief build notes on my web site once I'm done. I etched a Chord EGG PCB from the pattern in the magazine and mine measures 4.5 inches by 7 inches. Looking forward to your updated version. Rather than wait until I'm done to write up my notes, I'll do that as I go along, and share the images in this forum. A note on part numbers: I've kept the original PAiA part numbers for parts that correspond closely or exactly to parts in the original Chord EGG. For parts that are unique to my redesign, I use three digit numbers (e.g. R123). Last edited by stefanv on Wed Dec 23, 2015 5:33 pm, edited 1 time in total. 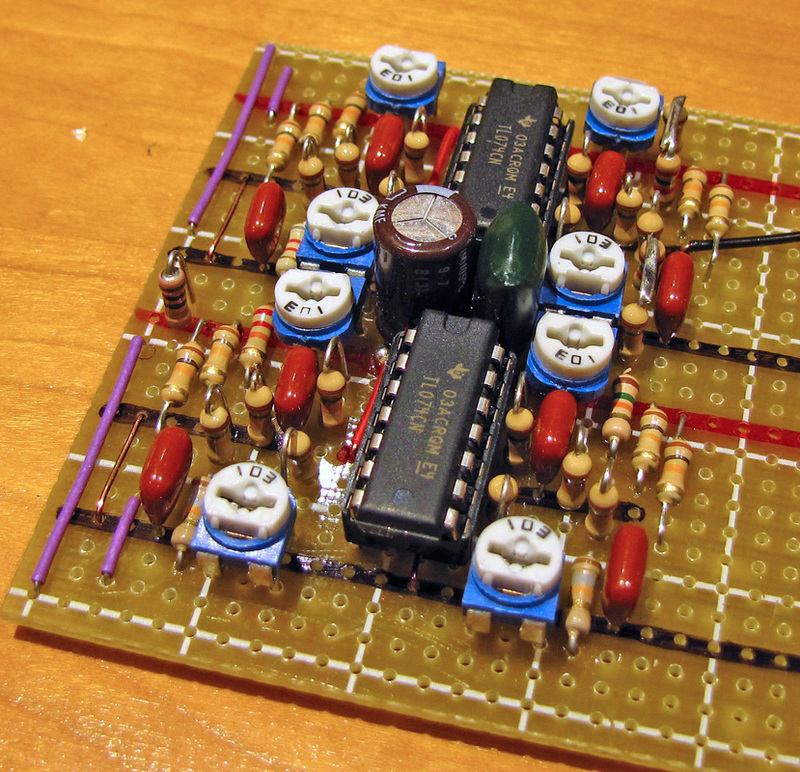 Next up are the chord randomizer oscillators, and the 2-bit to 4-line decoder.